Very responsive to our questions! See above... they sent an email to check on us right after check in. Great location - easy to walk to town or around the neighbourhood. Darling house. Quiet even tho it's very close to the main road into town. Clean as a whistle. Almost fully stocked kitchen. Great water pressure. Very comfortable king sized bed. Really enjoyed using the fireplace! Very nice property about 4 miles south of Grand Marais. Excellent. A huge shout out to Elizabeth who explained me clearly where to stay or what to do as I was new to the area. Exactly as shown in the pics. Really beautiful and serene. Well worth the price to stay. Beautiful location convenient town; everything you need including easy lake access for kayak, canoe or swimming, and cabin was super clean and stocked with everything. Loved it and will be back! I was very happy working with Cascade Vacation Rentals. All of the my questions were answered, all changes that I needed to make were completed without issue. I will use this facility again for rentals in this area. We had a sizable group for Temperance Landing 24 over the Memorial Day weekend and there was more than enough room for everyone. 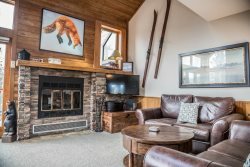 We were very impressed with the property, the furnishings were amazing, the cleanliness was great, the location perfect right by the hiking trails, the kitchen very well stocked with dishes and baking items, access to Lake Superior was literally right in front of the property and the view was wonderful. Al of our guests were equally impressed and we plan to make another trip to this same property in the future. the reservationist encouraged this cabin and told me it had unique decor inside that she loved. She was right! Very comfortable and accommodating! Too cool to really use the balcony furniture but plenty of places to sit and enjoy the lake, even if a very small cabin. Great house, nice and quaint for our group of 4. Was close to beach. Beautiful home, great location. Loved the beach access. We've been using Cascade Vacation Rental for 6 years now and just love working with you. Very helpful when I have questions and always enjoy the cabins we stay in. Amazing cabin! Beautifully appointed kitchen, modern bathroom and easy access to the lake. The view of the lake from the porch is lovely and there was virtually no boat traffic because the cabin sits at the end of the bay. I have had no contact directly with anyone, just emails. Lovely townhome very close to downtown Grand Marais. The view of the lake is slightly hindered by the evergreens, but they do provide some privacy. Upstairs balcony is more private than the downstairs patio, which does have some foot traffic in front of it. A great venue. So close to the lake; a good base of operations for exploring all of the North Shore--the parks, the towns, museums, etc. The cottage is extremely well constructed, everything works fine. The staff is exceptional. We needed a few more towels/wash rags & went to the rental office to get them. We were greeted warmly & helped immediately. Everyone was extremely friendly & helpful! We have loved Cedar Allee from the first time we stayed here. The latest improvements have made a fabulous house even more wonderful. We love the new grill, stove, wide-screen TV! No comment really because other than email did not have contact with anyone. Loved the location. The house was comfortable and cute. It worked out great. Great property! Great value! Great location! Loved the proximity to both the water (a stone's throw), as well as the proximity to local rivers and attractions. Will definitely be using Cascade Vacation Rentals again (this was our 4th stay)!